Who honestly doesn’t love going on a trip? Seeing all sorts of new places, getting to meet new and interesting people, and getting your hands on a variety of different dishes are just a handful of the reasons why traveling can be so much fun. But one must get a reading on all kinds of expenses and how much individual activities will cost. This will help one to make the best budgetary decisions possible. The free Trip Planner template will assist you in laying out a plan for your journey. The great aspect in using the planner is that it will help you make smart budget decisions to make sure that you won’t make a huge dent in your wallet. In the open planner template, you’ll see there are areas to fill in information about who’s going and the cost per person. The total cost is the sum of all the variables within the template and the number of travelers going. The costs will be calculated automatically, so all you have to do it fill in certain spaces. Start out by inputting the total number of people going on the outing and the length of the trip in days. If you’re driving on this excursion, enter information regarding gasoline and how many miles you plan on traveling. If you’re not driving, make sure to put No under the “Add to Trip” column. 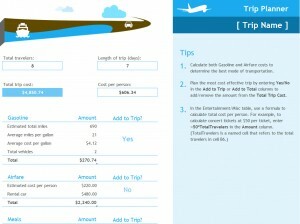 If you’re using air travel, add plane ticket costs and rental car costs in your calculations. Meals are a basic and necessary item to add to your list. Ten to twenty dollars for a meal should be fine. If you have hotel reservations, there are fields to add this into the trip planner calculator as well. Entertainment and other costs are the final part of the trip planner, so don’t be afraid to add any extra costs in that section.